The LaidBack® Pad Memory Foam Sleeping Pad Will Give you Better Sleep and More Energy to Access Adventure in Extraordinary Places. It's the perfect multi use Sleeping Pad; Ideal for Tent and Car Camping, in addition to sleeping in your Camper, Under the Stars or in a Hotel. As a solo adventurer or taking your FAMILY Camping, you'll LOVE having your LaidBack® Sleeping Pads with you. Overnight Guests will be Thankful when you roll out one of your Laid-Back Pads for them to sleep on instead of an Air Mattress. It literally takes seconds, and it won't lose air during the night. Store it in your closet, in your car, or just keep it unrolled under your bed for easy access to an extra bed. The LaidBack® Pad Bed Roll is about deeper sleeping, more stretching, taking more naps, and more relaxation. As the creator of this portable Memory Foam Mattress describes, "You can still be adventurous and sleep in exotic places fully rested, no matter your age or physical challenges. I've had chronic back pain for years and the LaidBack® Pad allows me to access all the beautiful places on my bucket list." The concept of the LaidBackPad Camping Mattress is to connect with nature and enjoy the powerful experience of sleeping outside. You will have more opportunities to camp, hike, fish, bike, climb, and sit around the campfire with friends and family. The LaidBack® Pad Bed Roll is made with a Proprietary 3 LAYER Foam Blend with 4 pound Memory Foam, giving you the feeling of a BED in this 2 3/8" thick Sleeping Pad. This gives your LaidBack® Camping Pad significant rebound and elasticity, allowing you to sleep on it for years without sacrificing it's quality or comfort. NO More SLEEPLESS Nights on a leaking air mattress. The LaidBack® Pad Camping Mattress will be your premium go to portable Camping Pad EXPERIENCE for years to come. 30 Day No Questions Asked Money Back Guarantee! Made in the USA of domestic and imported materials! 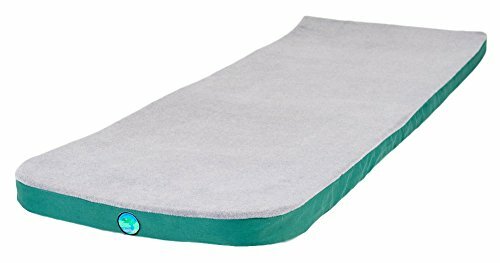 • The ORIGINAL Size LaidBack® Camping Pad Bed Roll Dimensions are 72" x 24" x 2 3/8" and Rolls Up to 13" x 12" x 24". The LaidBack® Pad has a BUILT-IN CONNECTOR system so you can connect multiple sleeping pads together to make a larger and larger bed. Perfect for your tent, when traveling and sleep overs. Weighing 8.5 lbs. per unit, the LaidBack® Camping Pad is lightweight to carry short distances with it's heavy duty straps and storage is EASY. • The LaidBack® Pad is made of the HIGHEST QUALITY materials for a Memory Foam Bed Roll Cushion. The Proprietary multi-layered Foam includes 4 lb. MEMORY FOAM that is CertiPur Certified and LOW-VOC with Cool Flow Technology; which balances your body temperature, keeps you warm, and provides Quick Recovery and CONTOURS to your body. The additional Open and Closed Cell foam Compensate for bumps on the ground beneath you, REDUCE Pain Points and assure that your body will not hit bottom. • A GREAT DEEP REST is GUARANTEED When You Use The Laid-Back Memory Foam Sleeping Pad for Camping, Travel, and Adventure. The LaidBack Pad is used by Military and Hunters and as a Topper for Long-haul Pilots and Dialysis patients. It is the premium roll-up camp pad for both men and women. With the new Connector system, you can sleep next to your loved ones in extreme comfort. Wake up with LESS PAIN and MORE OPPORTUNITY to Explore your favorite National Parks, Campgrounds, and Outdoor Areas. • The LaidBack® Pad Memory Foam Camping Mattress was developed to offer a SLEEPING EXPERIENCE outside on the ground, on a Cot, inside your home, or traveling that is similar to or better than sleeping in your own bed at home. The SOFT Polar Fleece top cover makes it great to lie down on, stretch or sleep on WHEREVER your adventure takes you. The LaidBack® Bed Roll has no air that can leak or pop and the DURABLE 1600 Denier Polyester Casing is Water-Resistant and Machine Washable. • The LaidBack® Pad is an Ultra COMFORTABLE Foam Sleeping Pad, making no place off the list for Car, Truck or Tent camping; make the LaidBack® Pad Memory Foam Camping Mattress your favorite piece of camp gear to UNPLUG, UNWIND and spend more time with nature, family, and friends by improving the quality of your life. Let lying down in nature Guide your Choices and Inspirations. If you have any questions about this product by LaidBackPad, contact us by completing and submitting the form below. If you are looking for a specif part number, please include it with your message.